I fell in love with an herb… again. Her name is Nettle (also known as nettles or stinging nettles) and she is a green goddess. I was first introduced to nettle by my amazing friend Jackie who taught me all of the health benefits and attractive qualities she has to offer (high in calcium and iron, lots of vitamins, etc). 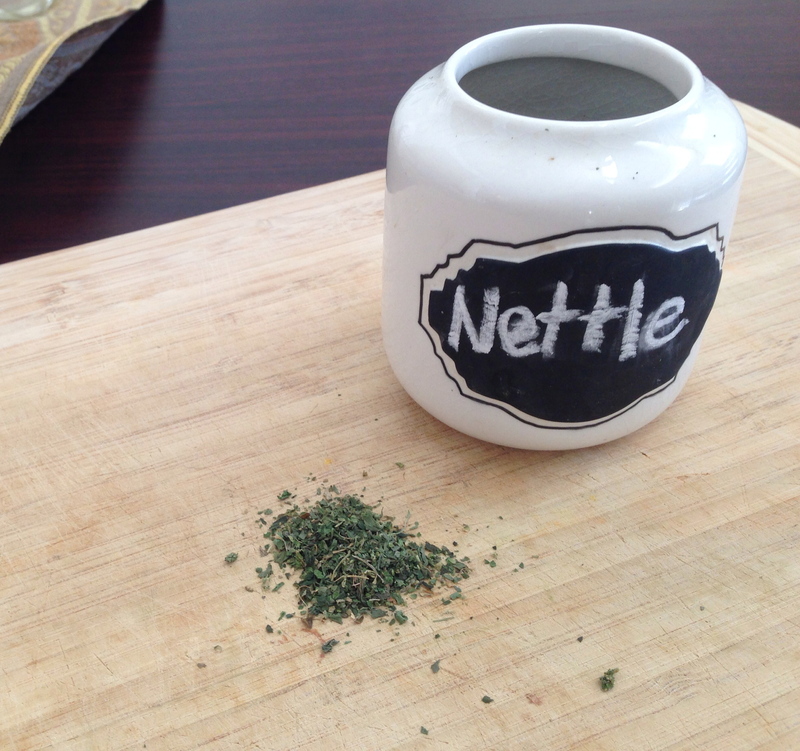 I quickly began including nettle in my tea combinations, and recently decided to make her more of a kitchen staple and include her in my cooking. Nettle is used to treat and heal MANY different conditions, imbalances, and deficiencies, and is often used to nourish the body and mind. Rosemary Gladstar describes nettle as “a superior tonic herb (‘tonic’ meaning that you cannot take too much of it), rich in iron, calcium, potassium, silicon, magnesium, manganese, zinc and chromium, as well as a host of other vitamins and minerals.” What a plant!! 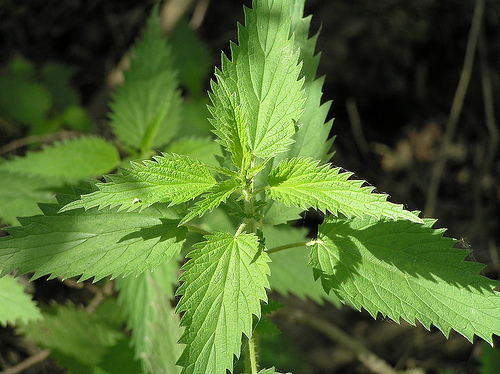 Nettle is often used to strengthen our nervous system, balance our emotions, restore energy in the body, build strong bones and teeth, promote kidney health, and bring calmness into our lives. The high levels of iron, calcium and vitamin A make it a great herb for women, and it is often used to increase reproductive health, support pregnant and nursing mothers, and assist women who are going through menopause (female power!). I have heard MANY herbalists recommend including this herb regularly because of the wide variety of nutrition it has to offer – strengthening our general health and wellbeing. So, you might be asking why I have recently fell in love with this herb all over again? Long story short, I received these cute little ceramic containers for Xmas last year (thanks Abby!) and when deciding what to keep in them (coconut palm sugar, sea salt, etc) I made the decision to keep nettle on hand so I could easily throw it into meals… and that is exactly what I started doing! I was a little hesitant at first because I know the earthly flavor that nettle gives to tea, but to my surprise, it was pretty much untraceable. To give it the real test, I began sprinkling it on my partners foods (salads, pastas, chicken parm, etc.) and he said nothing! For me, something like this is magic!! I LOVE begin able to amp up the nutrition of my meals, and nettle can be the perfect way to do that! Over the past month, I have been sprinkling this pretty green herb on my salads, veggies, eggs, and grains. I have added it to my salad dressings, mixed it into soups, and topped off sandwiches with a sprinkle. As a health coach, I live and love to make healthier meals even healthier (few things make me more excited), and when I come across something that really works, I love to share it with you. This, my beautiful friends, is one of those moments, and if you decide to try it, I hope you enjoy it as much as I do (please let me know!). Mountain Rose Herbs is my favorite place to order organic herbs online – they are fresh, free of chemicals, and harvested in a way that is in tune with the planet. You can order herbs (and many other awesome products) in bulk and have them shipped right to your door! Some other favorites of mine are their minced garlic, cinnamon, seaweeds and mushrooms. Tags: food, herbal medicine, herbs, nettle, nettles, nourish, nutrition, stinging nettle, superfood, tea. Bookmark the permalink. I was first introduced to nettle by being stung by the plant. I was young and not savvy. Now as an adult, I can truly appreciate it’s qualities. Thank you so much for sharing your article. Oh wow! Although I have not experienced a stinging myself, I heard it can be quite painful (that’s why I stick to the dry stuff). Thanks for sharing your story!